Already own a home in the Aspen Creek subdivision? Thinking of selling? Click here and read about current search trends & our web network. Aspen Creek subdivision is located at the intersection of the Foley Beach Express and highway 59 in Foley, AL just West of the intersection. Being this close to the express, which was connected to I-10 in September 2014, makes travel throughout the neighboring areas quick and easy. The homes in Aspen Creek are approximately 15 minutes from Orange Beach, AL and approximately 15 - 20 minutes from the public beach area and the Gulf Shores Hangout. The expressway really makes travel to Mobile, AL and Pensacola, FL easy and relatively traffic-free. Both of these larger local cities offer regional airports and all of the amenities that larger cities do, such as: numerous restaurants, shopping venues and entertainment destinations. 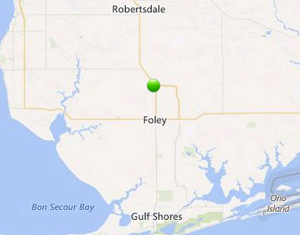 The homes in Aspen Creek are also close to downtown Foley which has grown exponentially in the past 10 years. Please let us know if you would like additional info such as, pictures, subdivision bylaws, recent sales figures by emailing info@condoinvestment.com or call (251) Area-Pro (251-273-2776) for immediate assistance or to schedule appointments to view current listings in Aspen Creek or other properties in the area.